Any plans you have to diet before summer, stop them immediately. 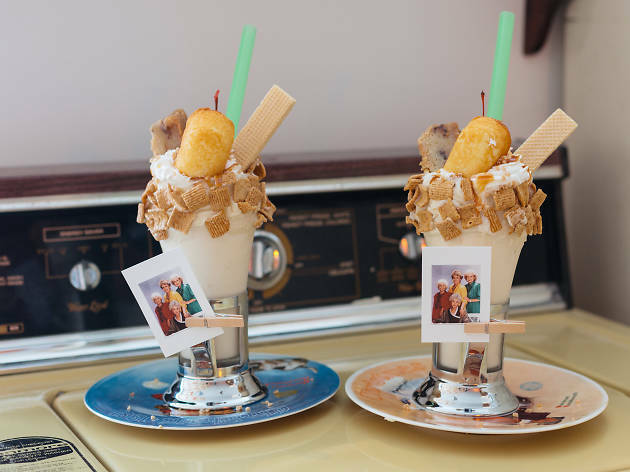 Vicky's House, Coconut Grove's new dessert bar, serves milkshakes so incredibly delicious you'll want to swim in them (sorry waistline!). The '80s-themed spot features a menu of pop-culture inspired shakes, ice cream floats, wine and beer—which you'll grab straight out of a retro fridge or washing machine filled with PBRs. As far as milkshakes go, they run the gamut from over-the-top to how-do-I-even-drink-this—each one more involved and made with ingredients you never thought would pair well together. There's the E.T. Goes to the Movies to Watch The Goonies, a vanilla-based shake served in a chocolate fudge-rimmed glass with caramel popcorn, whipped cream, Hershey's chocolate, Reese's Pieces, cola gummies and a fun-size Baby Ruth. 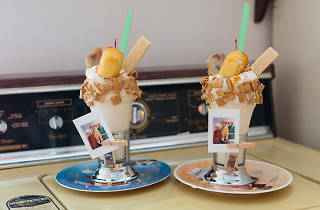 Upping the ante is the Breakfast Club, a vanilla milkshake with a peanut butter rim, Captain Crunch cereal, Miami Smokers bacon, a glazed donut from Salty Donut and a shot of espresso. If you dig the throwback menu, you'll love the spot's full-on '80s vibe, which owner Matt Kuscher (of LoKal, the Spillover and Kush) conceived as a nod to his childhood home in Maryland. He named the restaurant after his mom, Vicky. While we don't personally know Mrs. Kuscher, we can tell you she did have some pretty rad taste—down to the orange floral wallpaper and tiled floor, which Matt recreated with help from a local artist. Every light fixture, refrigerator magnet, toy, Nintendo and report card you see throughout the restaurant is original, too. How Mrs. Kuscher was able to store so much stuff over three decades and three different homes is damn incredible (we freak out when our inbox isn't at zero), but we're so glad she did.